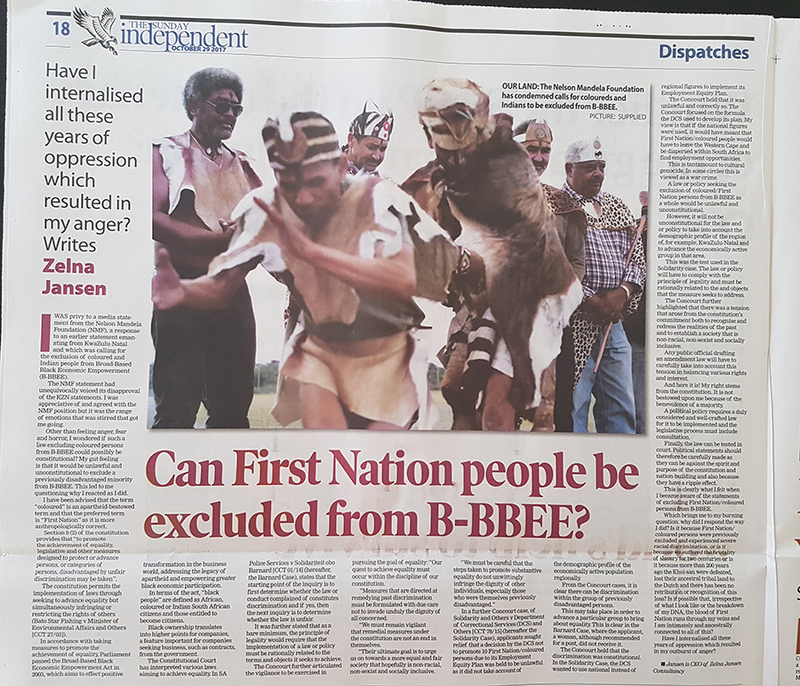 Is it constitutional to exclude Coloured / First Nation persons from B-BBEE? I was privy to a media statement from the Nelson Mandela Foundation (NMF), a response to an earlier statement emanating from Kwa-Zulu Natal (KZN) and which was calling for the exclusion of Coloured and Indian persons from Broad-based Black Economic Empowerment (B-BBEE). The NMF statement had unequivocally voiced its disapproval of the KZN statements. I was appreciative of and agree with the NMF position but it was the range of emotions that was stirred that got me going. Other than feeling anger, fear and horror, I wondered if such a law excluding Coloured persons from B-BBEE could possibly be constitutional? My gut feeling is that it would be unlawful and unconstitutional to exclude a previously disadvantaged minority from B-BBEE. This led to me question why I reacted as I did? I have been advised that the term Coloured is an apartheid bestowed term and that the preferred term is First Nation as it is more anthropologically correct. Section 9 (2) of the Constitution provides that “To promote the achievement of equality, legislative and other measures designed to protect or advance persons, or categories of persons, disadvantaged by unfair discrimination may be taken.” The Constitution permits the implementation of laws through seeking to advance equality but simultaneously infringing or restricting the rights of others (Bato Star Fishing v Minister of Environmental Affairs and Others [CCT 27/03]). In accordance with taking measures to promote the achievement of equality, Parliament passed the Broad-Based Black Economic Empowerment Act in 2003, which aims to effect positive transformation in the business world, addressing the legacy of apartheid and empowering greater black economic participation. In terms of the Act, “black people” are defined as African, Coloured or Indian South African citizens, and those entitled to become citizens. Black ownership translates into higher points for companies. A feature important for companies seeking business, such as tenders from government. In a further Concourt case of Solidarity and Others v Department of Correctional Services (DCS) and Others [CCT 78/15] (hereafter the Solidarity Case), applicants sought relief that a decision by DCS to not promote ten First Nation / Coloured persons due to its Employment Equity Plan, was held to be unlawful as it did not take account of the demographic profile of the economically active population regionally. From the Concourt cases, it is clear that there can be discrimination within the group of previously disadvantaged persons. This may take place in order to advance a particular group to bring about equality. This is clear in the Barnard Case, where the applicant, a woman, although recommended for a post, did not receive it. The Concourt held that the discrimination was constitutional. In the Solidariteit Case, the DCS wanted to use national instead of regional figures to implement its Employment Equity Plan. The Concourt held that it was unlawful and correctly so. The Concourt focused on the formula DCS used to develop its Plan. My view is that if the national figures were used, it would have meant that First Nation / Coloured would have to leave the Western Cape and be dispersed within the South Africa to find employment opportunities. This is tantamount to cultural genocide. In some circles this is viewed as a war crime. A law or policy seeking the exclusion of Coloured / First Nation persons from B-BBEE as a whole, would be unlawful and unconstitutional. However, it will not be unconstitutional for the law and or policy to take into account the demographic profile of the region of for example KZN and to advance the economically active group in that area. This was the test used in the Solidarity Case. The law or policy will have to comply with the principle of legality and must be rationally related to the terms and objects that the measure seeks to address. The Concourt further highlighted that there is a tension that arises from the Constitution’s commitment both to recognise and redress the realities of the past, and to establish a society that is non-racial, non-sexist and socially inclusive. Any public official drafting an amendment law will have to carefully take into the account this tension in balancing various rights and interest. And here it is! My rights stems from the Constitution. It is not bestowed upon me because of the benevolence of a majority. A political policy requires a duly considered and well-crafted law for it to be implemented and the legislative process must include consultation. Finally, the law can be tested in court. Political statements should therefore be carefully made as they can be against the spirit and purport of the Constitution and nation-building but also because they have a ripple effect. This is clearly what I felt when I became aware of the statements of excluding First Nation / Coloured persons from B-BBEE. Which brings me to my burning question: why did I respond the way I did? Is it because First Nation / Coloured persons was previously excluded and experienced severe racial discrimination, or is it because we suffered the brutality of slavery for two centuries or is it because more than 200 years ago the Khoi-san was defeated, lost their ancestral tribal land to the Dutch and there has been no retribution or recognition of this loss? Is it possible that, irrespective of what I look like or the breakdown of my DNA, the blood of First Nation runs through my veins and I am intimately and ancestrally connected to all of this? Have I internalized all these years of oppression which resulted in my outburst of anger?